Welcome the month of May with a fun class in the Rustic Barn at Deer Springs Winery. 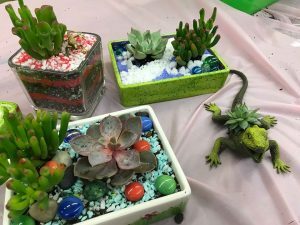 Urban Legends Art Studio will be here to guide you in making Spring Succulent Container Garden; perfect to welcome the warmer weather and sunny days! Also, a great Mother’s Day gift! The lovely ladies from Urban Legends will supply everything you need, including expert artistic guidance in putting your planter together. Deer Springs will include a glass of our delicious Pink Berry Spring Sangria to get the artistic vibe going! Wear your favorite Spring Garden Party hat and get a fun prize! Class Limited to 35 people, 21 and older only please.